How Do I Know When My DNS Has Propagated? Setting up DNS can be difficult. As it is necessary for the success of your online business, you need reassurance that it has been done correctly and everyone can get access to your new online presence. MxToolbox can help you check your DNS resolution, check status on your DNS propagation and monitor your DNS for changes. The first step is to test which servers are authoritative DNS and lookup the entries you’ve made for your DNS configuration. Our Free Tools give you all the lookups you need to check your DNS configuration. DNS: Check the authoritative DNS server. A: Verify the IP address of your hostname. AAAA: Verify the IPv6 address of your hostname, if you use IPv6. MX: Verify the IP address of your mail server. PTR: Verify the reverse DNS is properly configured. SOA: Verify your start of authority record is properly configured. MxToolbox SuperTool supports many other DNS lookups, but those above are those you should be checking at minimum. Checking is all of your DNS servers simultaneously is important. It’s possible that one server may not be properly synced. Our new, free, DNS Propagation tool checks all of your DNS servers simultaneously when you lookup a record, compares the Start of Authority record to all servers and highlights the server(s) that are different. 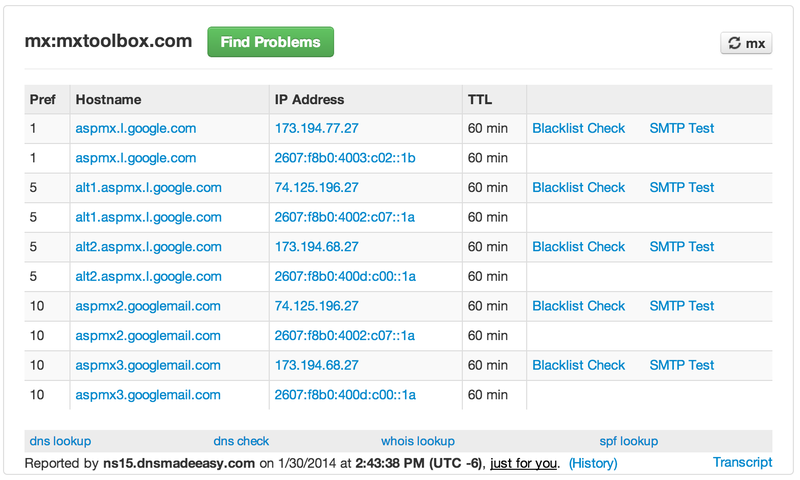 In one lookup, you can view the propagation of your records across your entire DNS pool. 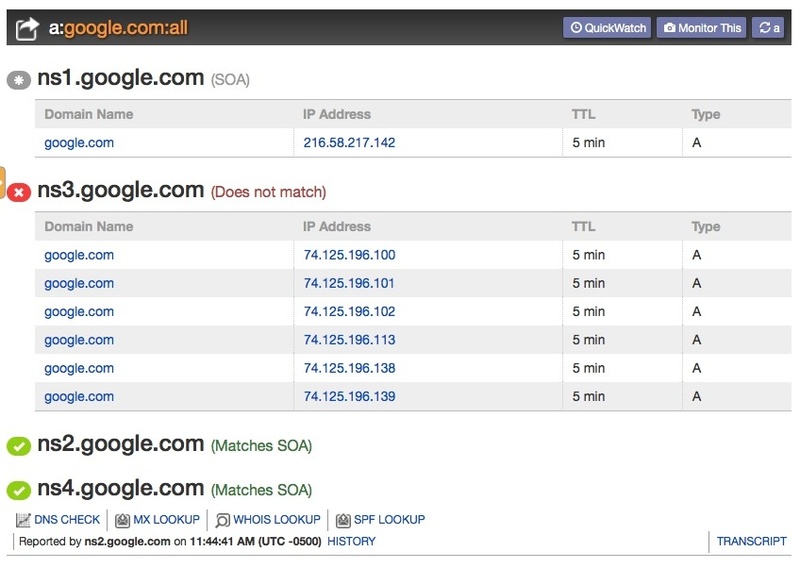 A well-timed search for Google.com’s A record shows them in the process of propagation across servers. MxToolbox recently launched DNS Zone Protect, a monitoring solution for all your DNS, that gives you immediate warning when any change is made to your DNS. With DNS Zone Protect, you get instant notification of changes to your domain’s DNS. This new monitor uses AXFR to monitor your domain’s DNS and compares it to previous DNS configurations. When a change is made, we flag it and notify you. You get peace of mind knowing that changes to your DNS are being externally monitored by MxToolbox. DNS Zone Protect provides current DNS status, across the entire domain/zone. Changes are easily recognizable with DNS Zone Protect. This entry was posted in Knowledgebase on August 28, 2015 by MxToolbox Blog. Here’s another example from our series on API’s of how one customer is using MxToolbox’s API to simplify their day-to-day work. There are dozens of systems affected. Each system has dozens of logs containing hundreds of entries for both good traffic and bad traffic. And you have to sift through it all to find common entries before you can back track it and analyze it. Wouldn’t it be easier if you had some automated way of doing reverse DNS on IP addresses? Would your system be faster if you could supply DNS records for domain entries and check IPs for blacklisting to highlight potential bad actors? That’s exactly what our customer has done. By integrated Blacklist and DNS lookups with their threat analysis tools, they have dramatically shortened the time it takes to analyze traffic pattern, determine emerging threats and diagnose past issues. This entry was posted in Knowledgebase and tagged API, Blacklist, DNS on August 18, 2015 by MxToolbox Blog. I’ve talked a little bit about API integrations and some questions you should ask yourself before digging in and coding. Now, I’d like to discuss some unique and interesting examples of how our customers have integrated with MxToolbox to make their daily lives easier. One of our customers has a consolidated email server management platform for small businesses. Sold as-a-service, this includes email server status and performance. As blacklist issues are naturally important as a blocker for email performance and delivery, this company contacted us about using the API to integrate our blacklist lookup technology into their centralized management console. Now, paid users of MxToolbox can view complete Domain Health information in their mail console, including blacklist information on all their email servers. Another MxToolbox customer is a regional Internet Service Provider with many small online business clients, both web and email hosting. Because they have a limited IP space, they’re using our Blacklist monitors rather than our Service Provider product for large IP spaces. Rather than using the API, they utilize our Callback Hooks to connect to their network monitoring servers. When one of their customers is blacklisted, our monitors call their systems, where they connect it to their customer’s account. The ISP’s techs then reach out to their customer to notify them of the blacklisting and work with them on security practices that will enable them to stay off of blacklists in the future. Since websites can be blacklisted due to a hack or malware infection and email servers can be blacklisted for spam, this integration gives them realtime insight into potential security and reputation issues that could affect their entire network. Further, because incidents are connected to their internet customer management systems, they have a history of which customers are problematic and can work to segregate them from “good” customers. This entry was posted in Knowledgebase and tagged API, Blacklist, DNS on August 14, 2015 by MxToolbox Blog. How do you API? Part, the Second. In the first post about API’s, I discussed some of the fundamental questions you should ask before investing time in integrating with an API. I’ll now address a few of the other questions. Undoubtedly, you really want someone to use your tool, widget, app, program or website. The more the merrier, right? Unfortunately, you need to consider scalability with your integration. First, can the API you are using scale with your demand? Does your provider have the bandwidth or could you quickly become their single largest user? Can you support adding new features, updating interfaces, etc. when users like your product and want more? Obviously, if your product is commercial, you’ll have thought about scale, but many don’t think about scale for internal use projects. I’ve seen a one-off project for a small group turn into a global time keeping product for an entire Fortune 100 company. You might not need to massively engineer every little product, but it helps to think about how you would if you had the demand. Okay, this may seem like a no-brainer, but you have to ask yourself, “Am I really doing something unique?” Often this is overlooked. Many people start off making a new app or website in a completely saturated market. To do something truly unique is rare and often it depends on having unique data you can mashup with other APIs. What do you bring to the table that is unique for your users? Again, there are very few truly unique data sets. Chances are someone half a world away has a similar issues to yours and has done something about it. If you find a unique dataset, run with it. But, be aware that if it’s truly unique, you may become dependent on it, creating support, maintenance and scaling issues. Check out any API you may use to ensure you can depend on it. MxToolbox provides an API to our paid and free customers that allows you to perform lookups, control and poll monitors and check your API status. Depending on your account, Free, Basic or Pro, you may have different access to Local or Network lookups or access to your monitors. We have many customers using our API on a daily basis to integrate their internal systems with our technology to make the work days easier. To learn more about the MxToolbox API, click here. This entry was posted in Knowledgebase and tagged API on August 11, 2015 by MxToolbox Blog. New features in the Professional interface. With all the new features, we decided we needed to share the good news. So, we’ve added a way that everyone can see our new features as we add them. Clicking on “New!” either on the “More” Tools page or in the Professional interface will give you access to a list of tools we added in the last 90 days. New features on the More Tools page. This entry was posted in Knowledgebase, Uncategorized and tagged DNS, New Tools on August 7, 2015 by MxToolbox Blog.